Custom Building Products, provider of flooring preparation products and tile and stone installation systems, recently strengthened its line of award-winning Aqua Mix tile and stone care products with a focus on grout haze prevention and removal. 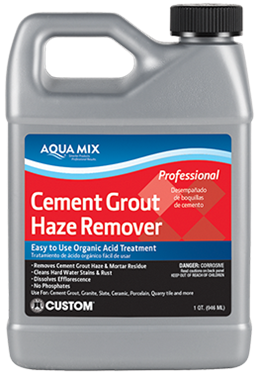 In addition to updating its Aqua Mix Grout Release, CUSTOM has introduced Aqua Mix Cement Grout Haze Remover and Aqua® Mix Non-Cement Grout Haze Remover to help installers avoid or address costly and time consuming call backs associated with grout residue on tile and stone. Aqua Mix Cement Grout Haze Remover is used to clean cemenitious grout residue as well as hard water stains, rust stains, efflorescence and lime deposits on natural stone, ceramic, porcelain and other acid-resistant tiles. A companion product, Aqua Mix Non-Cement Grout Haze Remover, is ideal for cleaning non-cementitious grout haze including Single Component, pre-mixed, urethane and light epoxy from natural stone and standard tile. Both products are easy to use and reduce the time required to clean tile after grout haze has occurred. Reformulated Aqua Mix Grout Release is a temporary, water soluble, pre-grout coating that serves as a protective layer between the tile and grout, making cleanup easier on both horizontal and vertical surfaces. The new, thicker formula Aqua Mix Grout Release has greater viscosity and better coverage making it ideal for preventing haze on even the most highly susceptible textured or porous tile and stone. It’s also useful at minimizing picture framing when only spreading grout over joints on larger tiles.